Schleswig-Holstein Musik Festival, July 1994. After Abraham Sutzkever’s 'Honik fun a wilder bin'. First performance at the 'Bayerische Akademie der schönen Künste', July 1997. After poems in Yiddish by Abraham Sutzkever. Commissioned by the City of Munich. First performance at the Literatur-Woche München, March 1998. III. Und, IV. Leidenschaftlich, V. Vorzutragen. First performance in Bochum, 2000. First performance at the SWR-Radio Concert Series, 2002, between Schubert’s Moments Musicaux. First performance in Theâtre Châtelet, Paris, 2002. After the poem-cycle 'Hebräische Balladen' by Else Lasker-Schüler. Commissioned by the Culture-Foundation North-Rhein Westphalia. First complete performance at Museum Baden, Solingen, 2003. Duration 60 minutes. Available in print. First performance in Osaka, Japan, May 2005. Duration 18 minutes. Available in print. With the Movements Psalm, Rauch (Smoke). Duration 14 minutes. Available in print. After the novel by Anne Michaels. 18 short movements. First performance within a concert of the Südwestrundfunk, Baden-Baden, commemorating the 60th anniversary of the end of World War II, May 2005. Duration 32 minutes. Available in print. Three movements: Auge der Zeit, Psalm (also recited), „Sandvolk“. First recording Auritus-Quartett, NEOS. First performance Freiburg, 2009. 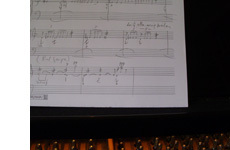 Score and parts available in print. After poems by Paul Celan. Duration 9 minutes. Available in print. Commissioned for the 2nd Lepthien-Piano-Competition, Freiburg, 2007. Duration 4 minutes. Available in print. First performance on July 9th, 2007, Munich. 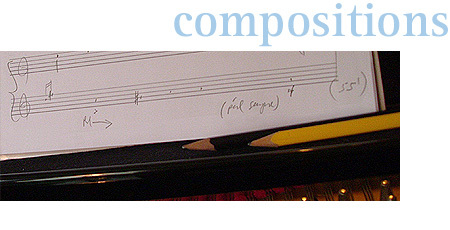 Score and orchestra-material available in print. After Else Lasker-Schüler. First performance Auenkirche, Berlin, 2007. Duration 6 minutes. Available in print. 1st movement after psalms 69, 130, 144. Two additional movements planned. Duration 5 minutes. Available in print. Commissioned by Pianofortefabrik C. Bechstein. First performance in Mannheim, May 2009. Libretto by Simon A. Rosenbaum and Gilead Mishory. Duration 100 minutes. Excerpts available in print. By Giuseppe Tartini. Adaption for piano solo. First performance Israel, November 2011. Commissioned by maestro Osamu Sasaki, Yokohama. Birds’ Morning-Greeting; My Hamster; Scrambled eggs; Grandpa’s Hearing-Aid; Anna plays, Magdalena disturbs…; Grandpa is Sleeping; Grandpa and Grandma on the Motorcycle; The Strange Watch; The Golden Swiss Watch; Evening-Thoughts. First performances May 2011 in Vienna, Tel Aviv, Tokyo, Osaka. First performance Israel, November 2011. After Landolfi, Wallach & Goethe. First performance Freiburg, January 2012.
for the 25th anniversary of its synagogue. First performance Freiburg, 4. November 2012. Duration 21 Min. Available in print. Duration 12 Minuten. Available in print. Duration 5 minutes. Published by Peermusic. An Aeneas: 2. She. Delirium 3. Labyrinth 4. Father. The touch. 5. The sea for piano solo..